Ancor Loc New Zealand proudly promote and distribute C&M centralizers and products. C&M Manufacturing is the leading supplier of earth anchor and grouting products to the foundation drilling industry. All C&M products are compatible with Williams Form Engineering, Reid Bar, Dywidag and Con-Tech Systems anchor assemblies. Use with bare bar/multi-bar, strand/multi-strand, corrosion protected anchors, auger cast piles/mini-piles, soil nails, hollow-bar or smooth casing applications. All products are available from Ancor Loc New Zealand. 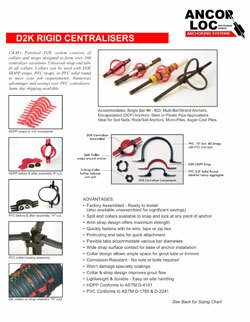 Refer to the C&M Centralizers website for product information and specs.